Lantech LSC-1102B is a full set serial device within two serial ports as one is a RS-232 port and other one is a 422/ 485 (Auto-Detective) and it provides one socket connection port. Lantech provides new ways of connecting legacy serial devices to a Local Area Network (LAN) or Wide Area Network (WAN). TCP/IP serial devices are designed to operate serial ports over 100Mbit/s Ethernet networks. The data is transmitted via TCP/IP protocol. Therefore control is available via Ethernet, Intranet and Internet. LSC-1102B serial device is packaged in a PVC material case well suited for industrial environments. All serial ports operate in common industrial configuration. The serial device can be configured as network server or network client. In the client mode, it can be installed in network which is protected by NAT router or firewall, without the need of a real IP address. The firmware of LSC-1102B can be reprogrammed directly via Ethernet network to keep up with latest network standards. 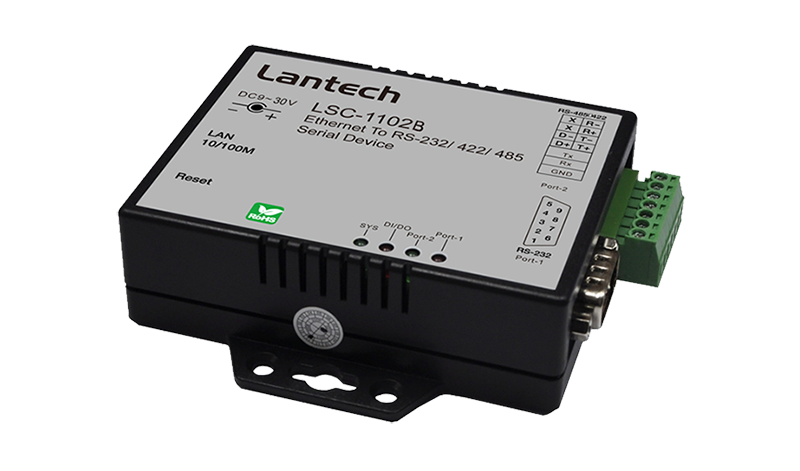 Lantech LSC-1102B is one of the best serial devices for industrial applications.